CORSAIR DDR4 VENGEANCE RAMCORSAIR VENGEANCE RGB PRO Series DDR4 memory illuminates your system with captivating dynamic multi-zone RGB lighting, while providing the optimum in DDR4 performance and stability. Every module features ten separately controlled RGB LEDs, while the wire-free design makes installation easy. Take control with CORSAIR iCUE software and completely customize every module’s lighting to match your system, or easily synchronise lighting across all your CORSAIR products with Light LINK. A custom designed PCB provides the highest signal quality for the best level of performance and stability on the latest AMD and Intel DDR4 motherboards, while specially screened ICs unlock superior overclocking. 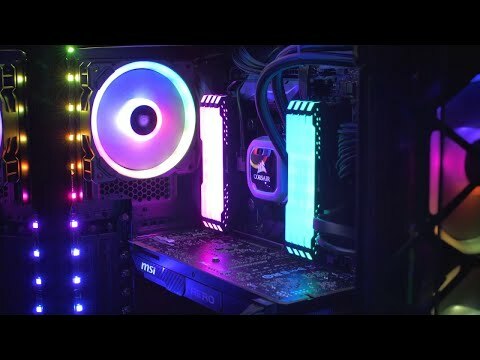 NEXT GENERATION SOFTWARE The powerful integrated CORSAIR iCUE software brings your system to life with vibrant RGB lighting. You can control and customise dozens of pre-set lighting profiles with a range of user modifiable colours and LED brightness, which will perfectly colour coordinate with your system. 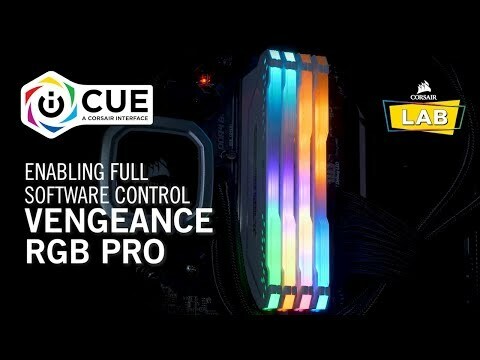 LIGHT UP YOUR SYSTEM CORSAIR VENGEANCE RGB PRO Series DDR4 memory features mesmerising dynamic multi-zone RGB lighting. Each stick of memory features 10 ultra-luminous RGB LEDs, which allows you to light up your system with vibrant harmonised RGB lighting. STYLE MEETS SPEED VENGEANCE RGB PRO Series performance PCB is custom designed and broadly tested to deliver zero compromise between style and speed. Boosted for high-frequency performance on the latest Intel® and AMD DDR4 motherboards, each element is built using carefully screened ICs for comprehensive overclocking potential. IMPROVES THERMAL CONDUCTIVITY The VENGEANCE RGB PRO features firmly screened memory, which is thoroughly screened ICs for comprehensive overclocking potential. The aluminium heat spreader substantially improves thermal conductivity for superb memory cooling even when overclocked. MAXIMUM BANDWIDTH AND TIGHT RESPONSE TIMES CORSAIR VENGEANCE RGB PRO is optimised for peak performance on the latest Intel® and AMD DDR4 motherboards, ensuring outstanding results each and every time. 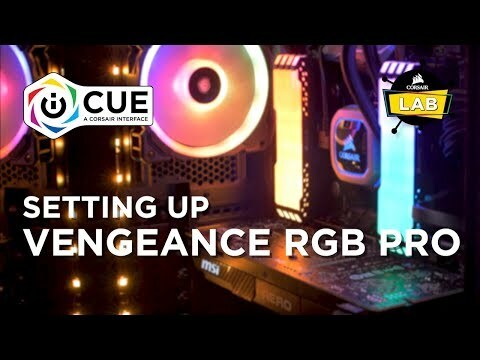 For a seamless install the VENGEANCE RGB PRO does not require wires or cables. Utilise XMP for Overclocking in Seconds CORSAIR VENGEANCE RGB PRO includes a single BIOS setting which is only required to set your memory to its ideal performance settings, for optimum performance. For complete peace of mind it has a limited lifetime warranty.